Ice Make offers a large range of Ice Cream and Ice Candy Machineries which includes machineries like Ageing Vat, Pasteurizing Tank, Ice Cream Hardener, Deep Freezer etc. Producing ice cream mix requires a high degree of flexibility and efficiency, with the need to handle a variety of dry and liquid ingredients, adapt to seasonal demand fluctuations and create an innovative and varied product portfolio. Successful mix preparation requires knowledge of many different aspects of production, including freezing, handling, homogenization and pasteurization as well as an understanding of how these processes affect your ingredients. To ensure the highest quality ice cream without compromising integrity, uniform mixing of dry and liquid ingredients requires optimal dispersion and operational efficiency. Temperatures and timing along with precise control and gentle handling is critical to safeguard product quality. ICE MAKE offers a complete range of equipment for ice cream mix preparation for small and medium scale especially designed mix plant unit. Mentioned price is for 100 LPH capacity. The plant comprises of Pasteurizer, Filter, Mix Pump, Homogenizer, PHE & Ageing Vat. We also provide complete Ice Cream Plant, for price and other details please contact our sales person. Within a short time period, we are engaged in presenting an excellent grade of Deep Freezer Type Ice Cream Hardener. 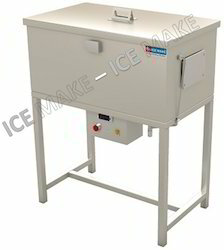 This freezer is manufactured using quality metal alloy. 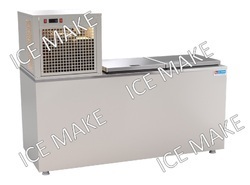 The outer and inner part of the freezer is manufactured using pre-coated GI; top and door of the freezer is developed utilizing stainless steel grade 410 magnetic alloys; the inner bottom is made using stainless steel grade 304. The provided freezer is manufactured using latest technology. Additionally, our provided freezer is processed adhering to industry standards and quality norms. Note: Above mention rate is inclusive of GST and excluding transportation. We are exporting Ice Candy Making Machinery. Export quality Ice Candy Making Machinery of our manufacturing unit confirms world class quality and standards and are widely used in domestic and overseas markets for making Ice Candy and roll cut ice creams. "Total working height of machine with stand is 35"
We are ranked among the trustworthy entities offering a wide range of Choco Coating & Defrosting Tank. These tanks are used for choco coating on ice candies and defrosting from moulds. The offered tank is equipped with coil, control box and stainless steel body. Offered tank is manufactured using stainless steel materials and approved electrical components. Provided tank is largely utilized in shops and commercial arenas. Clients can get the tank from us at industry's best price range. As one of the leading entity of this domain, we are engrossed in providing supreme quality Demoulding and Defrosting Tank. The offered tank is made available in single and double mould sizes. The dimension of single mould is 27” x 14” x 34.5” and double mould is 27” x 23.5” x 34.5”. The tank is manufactured adhering to IDM-I for single mould and IDM-II for double mould. Our engineers have developed the tank using stainless steel materials of grade 304 along with in set quality guidelines. We are engaged in offering qualitative range of Ageing Vat that are made of Stainless steel to make them more durable. 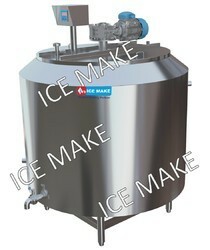 These Product are used for making ice creams and other similar items. Our Ageing Vats are durable, reliable and easy to operate. Our offered Pasteurization Units are used in the ice cream and dairy industry to heat the milk and ice cream mix at very high temperatures and then swiftly cooling it by Ageing Vat, before it is further processed. Our offered pasteurization tanks are high volumetric tanks which can pasteurize large volumes of at a time. We provide a solution to the variegated demand of Ice Cream and Candy Hardener in the market. 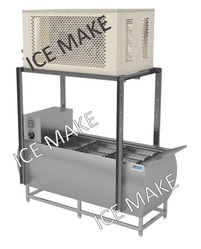 We are one of the well-known name of Ice Cream Pasteurizer manufacturer. The offered pasteurizing tanks are used in the ice cream industry to heat the ice cream mix at very high temperatures and then swiftly cooling it, before it is bottled for sale. Our offered pasteurizing tanks are high volumetric tanks which can pasteurize large volumes of ice cream mix at the same tim. The offered pasteurizing tanks are made from high grade stainless steel which can hold chemicals for a long time, till the wear and tear make them fall apart. We are offering of Tunnel Type Hardener. 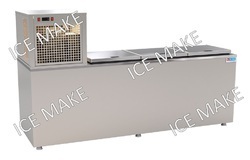 Our heavy duty, high speed machine are ideal for Ice Cream, Ice Candy and Frozen Food industries. These machines are widely used for hardening all type of Ice Cream, Ice Candy, frozen food and packed food. Supported with advanced technology we develop high-end Ice Cream Hardener Machinery which are eco-friendly in nature. We undertake bulk orders and promise to delivery right on time and at competitive prices. This Ice Cream Hardener pulls down the temperature of Ice Cream in minimal time. 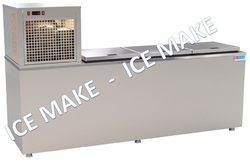 Ice Make made Hardener has wide range of capacity.